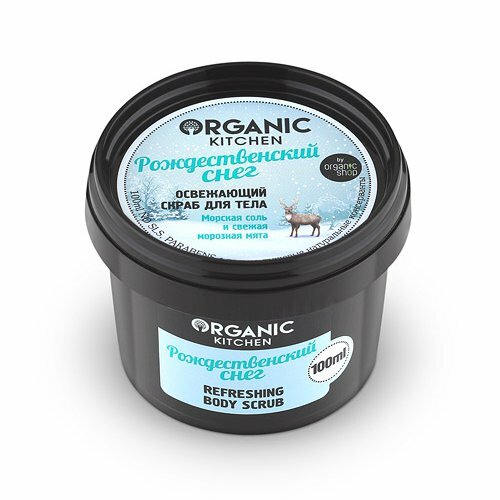 Christmas Snow Refreshing Body Scrub is produced by the Russian beauty brand Organic Shop for its Organic Kitchen series. This scrub is formulated with sea salt and fresh peppermint. It excellently cleanses the skin, stimulates its renewal and gives an incredible sensation of frosty freshness. The product is free of parabens, phthalates and artificial colourants. Fresh peppermint contained in the scrub has a pronounced toning, energising and refreshing effect. It helps to get rid of toxins, normalises sebum secretion, relieves irritation and inflammation. Sea salt deeply cleanses the skin, removes dead epidermal cells, stimulates skin cell regeneration and has an antiseptic effect. The scrub is enriched with iris root oil and cladonia extract. Iris oil helps to keep the skin hydrated by retaining moisture in epidermal cells and restores skin elasticity. Cladonia is a northern lichen species, its extract as a toning effect, regulates amino acid metabolism, stimulates skin cell regeneration and prevents premature skin ageing. Directions. Apply a small amount of scrub onto wet skin, massage well, rinse with warm water. Ingredients. Maris Sal, Glycerin, Cetearyl Alcohol, Butyrospermum Parkii Butter, Sodium Cocoyl Isethionate, Mentha Piperita Leaf, Iris Pallida Root Oil, Cetraria Nivalis Extract, Parfum, Chlorophyll. Want to buy Christmas Snow Refreshing Body Scrub? Call us or submit your order via our web site!